Laughter seemed to be everyone's initial reaction when CBS 3 asked people about a possible UFO sighting in Amherst. However, laughter aside, it was a hot topic in town on Thursday. "Yeah, I actually heard a lot about it when I got into work this morning. I didn't hear a lot about the story, but people were talking about it," said Ben Fellows, an Erving resident. 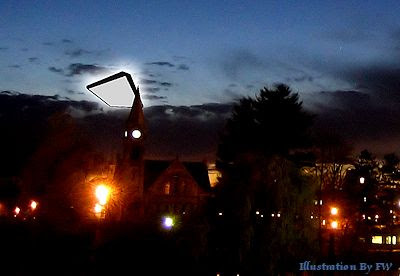 On Tuesday between 5 p.m. and 7 p.m., several witnesses said they saw a diamond shaped, dimly-lit object in the sky. The object had been reported to be moving slow and hovering about 75 to 100 feet above the ground. A plane has been one possible idea of what the mystery object could be, but people have heard otherwise. "From what I read in a newspaper, Westover saw nothing on their radar, so who knows what it could have been," said Jerry Daly, an Amherst resident. However, do people in Amherst really believe it could be a UFO? Some people told CBS 3 that it's possible. "It could have been a UFO ... no one really knows if it was or wasn't," said Daly. "I guess you could see a UFO just about anywhere ... usually in less populated places than Amherst but, you know, I guess you can see them anywhere," said Fellows. . . .
MY UFO EXPERIENCE | "We Stood There and Watched This Diamond Shaped Group of Stars As It Moved Very Slowly Over Both of Our Homes"